First introduced in late 2010 as a 2011 model, the Lexus LFA had a difficult life, despite being one of the most heroic technological efforts ever put on by Toyota. Although it had a limited run, the LFA never sold as well as its other supercar rivals. Unfortunately, Lexus has finally given up on its supercar and it shall be no more. Autocar is reporting that the last LFA ever built is a white Nürburgring model. 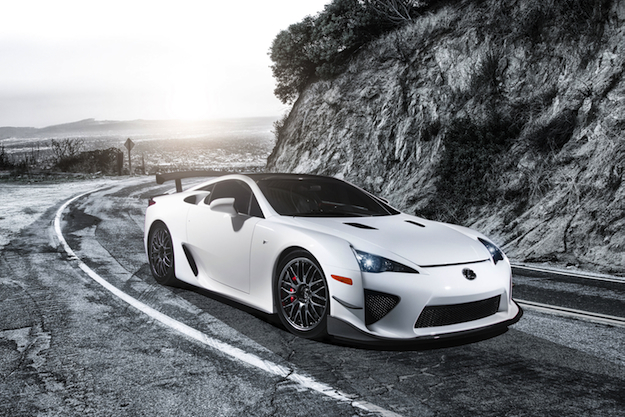 Powered by a 4.8-liter V10 engine producing 552 horsepower, the LFA had an asking price of $375,000. Although the sticker price was high compared to the Nissan GT-R at $97,820, Lexus was only breaking even at that price, as research and design had been so costly. Hand-built for two years, only one LFA was built each day — up to 20 per month — by Lexus’ most skilled technicians. The announcement not only brings the LFA to an end but also extinguishes hopes for a convertible version, which had been displayed in concept form only. The final Nürburgring packed-equipped LFA featured 10 more horsepower than the standard LFA, a recalibrated transmission, a special front splitter, lightweight alloy wheels, and adjustable suspension. All of these changes were based upon the LFA race vehicles, which participated at the 24 Hours Nürburgring. Despite the end of LFA, rumors are spreading that the engineering masters over at Lexus might try their hand again at a supercar with the LFA II. Next time, however, maybe they’ll add a bit more panache and lunacy to the mix so that it might better compete with the Ferraris and Lamborghinis of the world. From city cars to supercars, anything goes at the New York Auto Show. Automakers from all over the globe will travel to the 2019 edition to unveil their newest concept cars and production models. Chevrolet has major changes in store for the eighth-generation Corvette. The coupe will arrive in July 2019 with a mid-mounted engine. Spy shots, insider information, and rumors give us a good idea of what to expect.